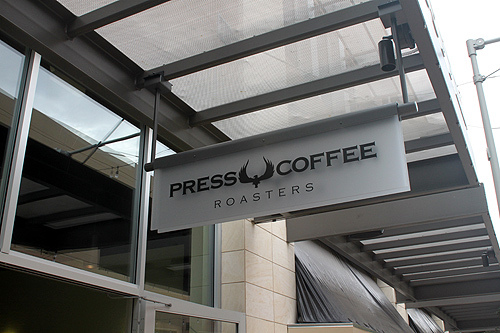 The newest coffee shop on the block is Press Coffee Roasters. It is the second store by the team at Press Coffee, who opened their first shop just 2 years ago at CityNorth. It opened on Friday, November 19. The new shop signage at Scottsdale Quarter. Grand Opening celebrations are planned for Black Friday, November 26, but until then the shop is open and has a limited supply of food items (full coffee bar is open). 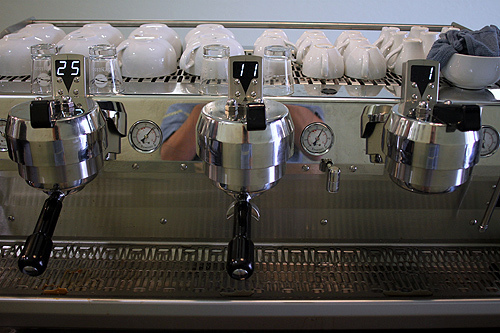 Equipment: Synesso espresso machine (3 group) with new digital timers and some sweet calibration equipment. They have a Trifecta in the store, too! 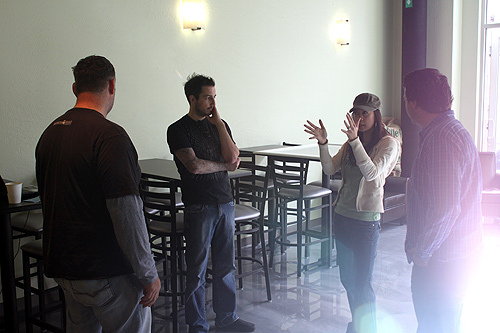 Steve Kraus, Jason Calhoon, Tram Mai, and Brian Clemens discussing the new shop. The bar and espresso machine. The shop is easy to find. Just park in the south parking garage and as you exit the parking area turn north and it will be across the street on your right hand side. It’s about 200 ft from the Apple store. It’s five minutes from my house! I have waited years to have a coffee shop within spitting distance. 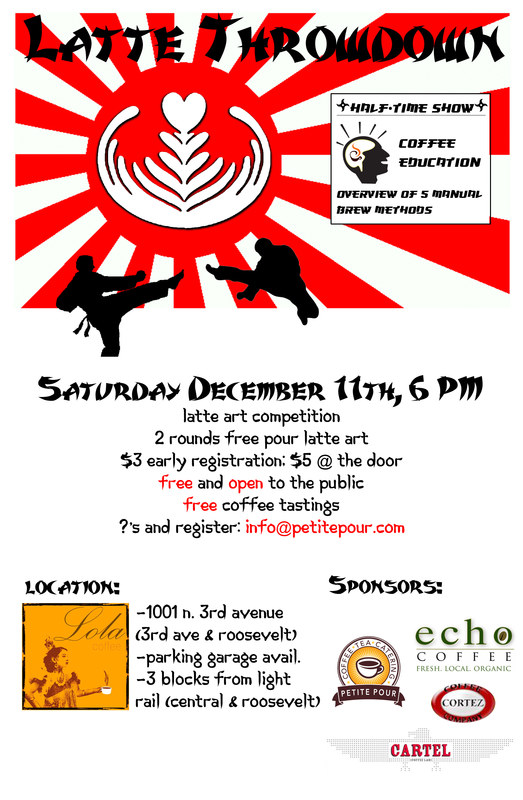 I’ve envied friends who lived next door to a great coffee shop, and now it’s my turn! I’ll probably be over here frequently. 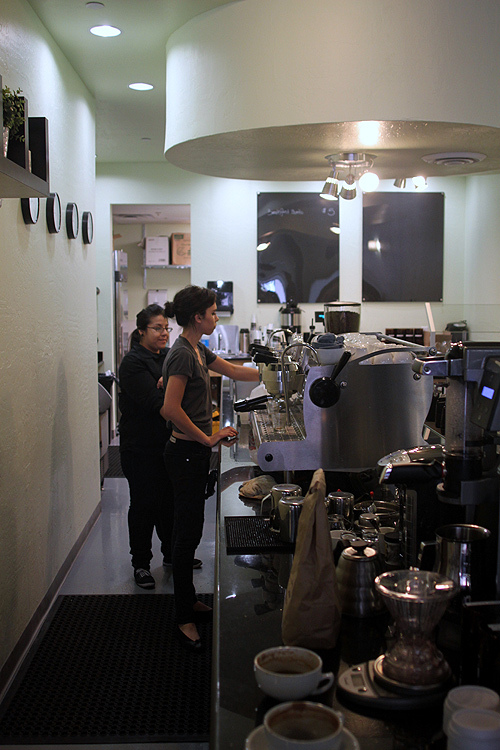 It’s Press Coffee — and they’ve been both an advocate for coffee culture in the valley, and proven that a coffee shop can be successful in the north valley. They roast their own coffee — and it’s delicious and consistent. Yeah, I probably sound like a walking advertisement, but it’s warranted. Because they serve excellent coffee, and understand the craft. It was great to see you and your wife this weekend at Press! I agree with you, that their coffee is delicious and consistent. For anyone who tried their espresso blend last year (when they first started roasting), they have changed it completely and it’s quite delicious! Press has also done a great job of continuing to push their quality higher and higher; I can’t wait for some of their coffee offerings. It’s neat to see Steve’s passion for the craft both in roasting and coffee preparation. Also good to see many regulars from City North dropping by to congratulate the team on shop #2. Way to go! Visited the new shop last week. I’m just bummed I never got to work on the synesso. Steve sent me away with three bags of coffee. I am digging on the costa rica cafetalera herbazu. If you haven’t tried any of the stuff Mitch and Steve have been getting in, I recommend getting a couple bags for the holiday. And Brian, I’m sure you would have loved dethstaar on the synesso 🙂 Congrats to Steve and the gang! Best Chai Latte I have ever had!